Pushpa Yaga Mahotsavam was conducted amidst religious fervour in the temple of Lord Kalyana Venkateswara Swamy, Srinivasa Mangapuram on Tuesday. 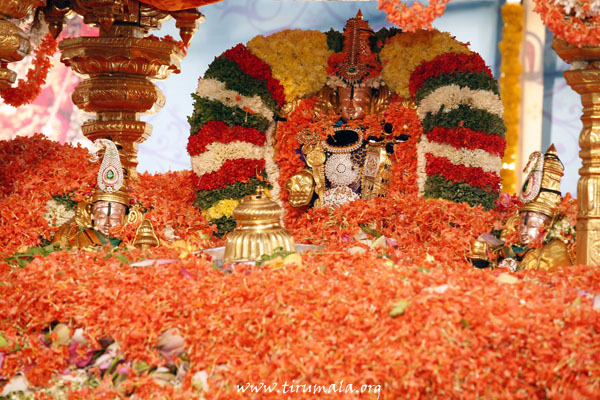 Generally, this utsavam was used to conduct to pray the god to save the manking from natural calamities such as cyclones, famine, earth quake etc., This utsavam is usually conducted on sravana nakshatram day the birth star of Lord Venkateswara. Nearly 5 tonnes including 18 kinds of flowers are used in the Pushpa Yagam . Later, unjal seva and veedi utsavam was conducted to the Lord Kalyana Venkateswara Swamy.